One of the techniques I’ve learned in the last couple of months is how to do a square start. It’s a good way to start a half wrap on a stock whip handle that you don’t want to completely cover and I’ve used it three or four times as a carapace on the first part of the thong on some bull whips. I think it will work for any even number of strands but I’ve only done it for 16, 20 and 24 strand pieces. 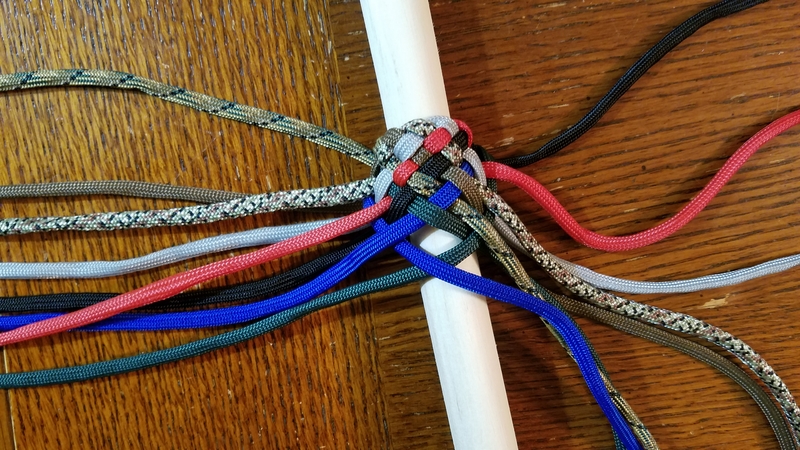 I’m pretty sure it’s actually just a multi-strand Turk’s head knot, but I am often wrong. 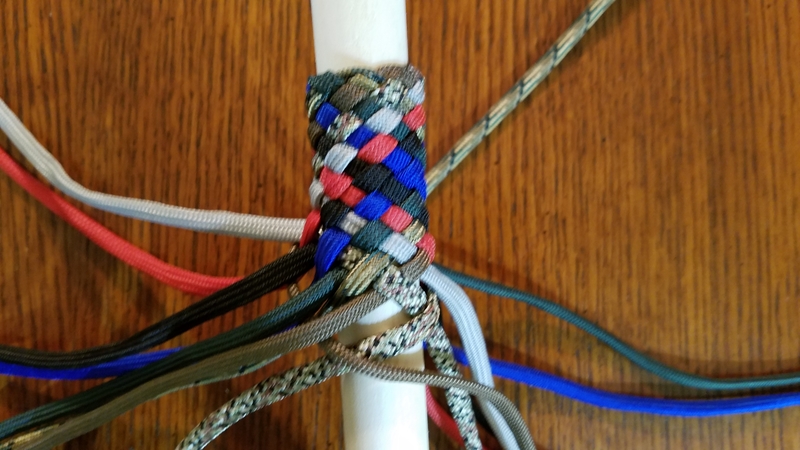 I learned this from Ron Edwards book on whip making. The example below is 16 strands. 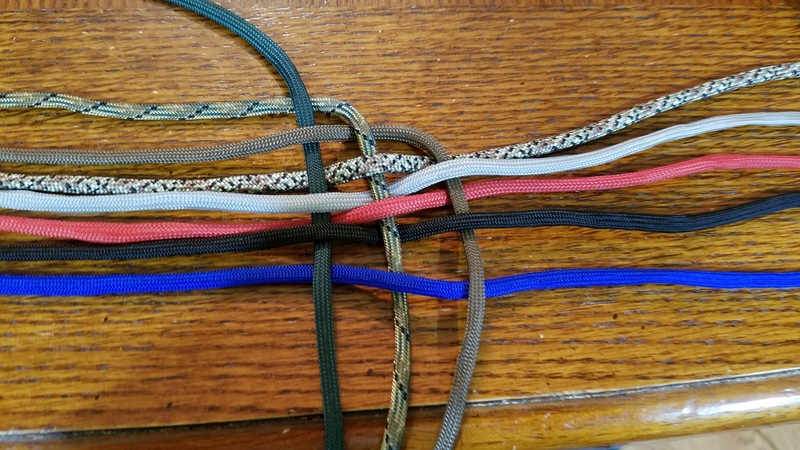 Lay out 8 strands parallel to each other on a flat surface and find the mid-points. Take the top strand, bend it at the mid-point to 90°, then, starting with an over, weave it through the remaining strands in an over 1, under 1 pattern. 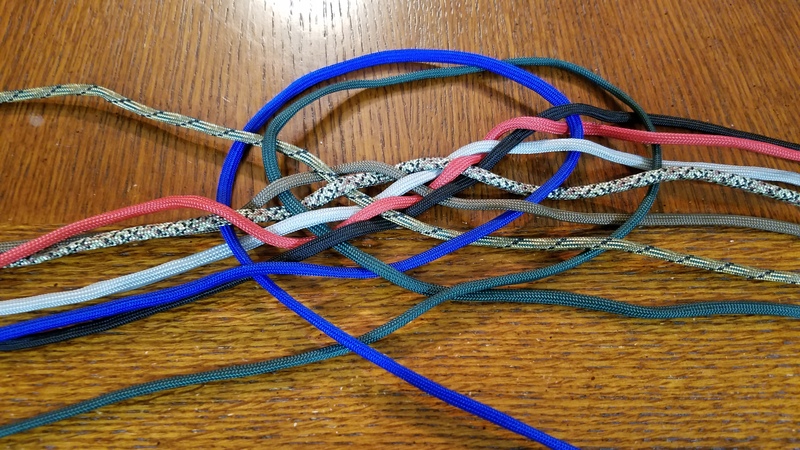 Continue this pattern with the remaining strands except the last one (the blue one in this example. 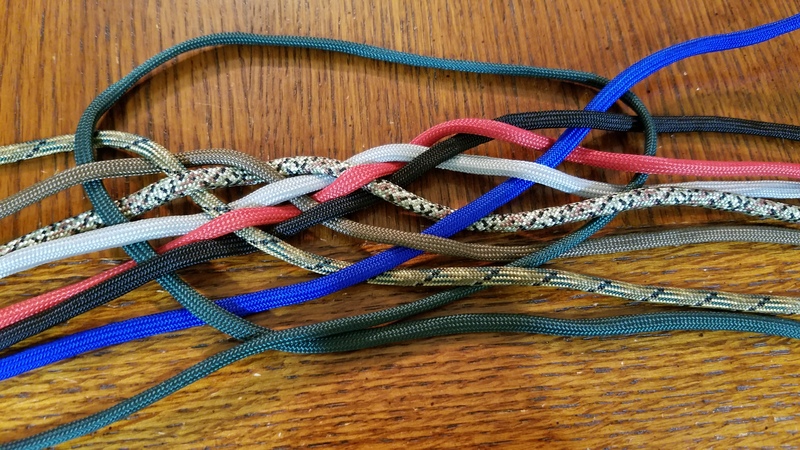 Take the top left-hand strand (the green one) and arc it over the weave to the right-hand side and weave it through, beginning with an under 1. 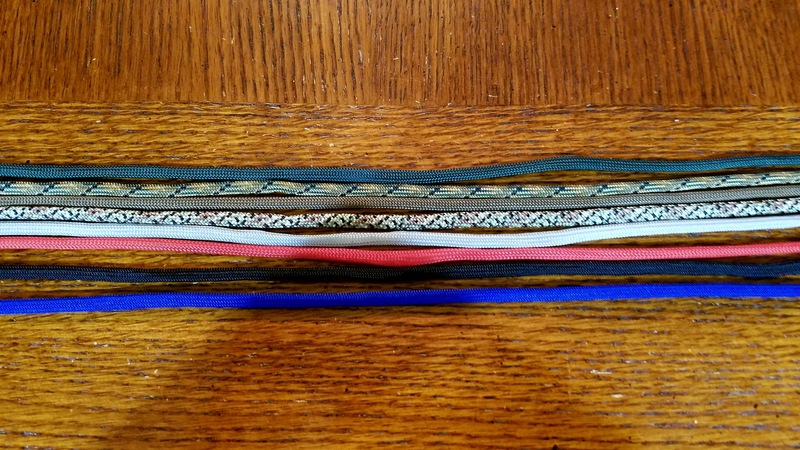 Take the top right-hand strand (the blue one) and weave it through, beginning with an under 1. 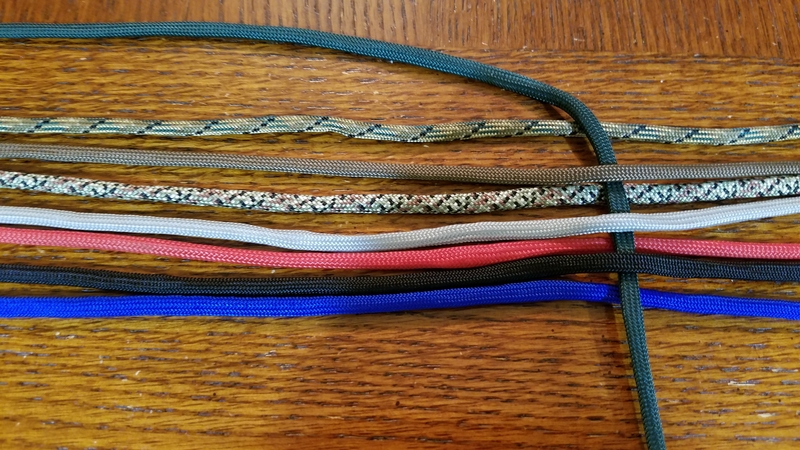 This picture isn’t great, the blue strand goes under the cammo strand, over the gray strand, under the second cammo strand, over the silver strand, under the red strand, over the black strand, under the blue strand, and over the green strand. 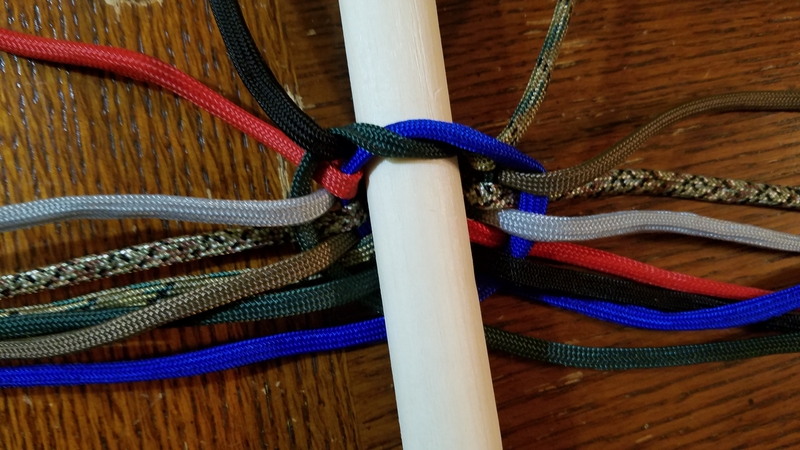 Pick the entire work up, being carefull to keep the strands in order and place it on the handle you wish to cover with the two arcing strands in the back of the handle and work out the slack. Continue the over 1,under 1 plait (diamond plait) or transition to another plait if it suits you. Here is one of the whips I used this technique on.